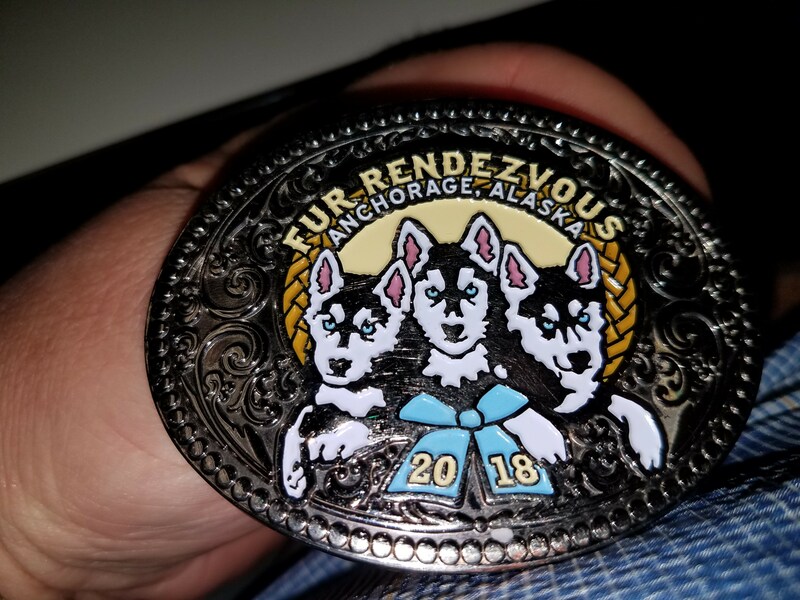 Here is this years Anchorage Fur Rendezvous (Fur Rondy) buckle. I get the pin and tie tack, every year, for my massive collection. I started collecting them when I lived in Alaska...oooooh, thirtyish years ago? Now my collection has...grown, somewhat. I have plates, mugs, belt buckles, you name it. I do, however, refuse to buy "spoons." Dunno why. They just seem too cheesy I guess. I even have 1 oz silver coins, from the Alaska mint. I have just a few of the belt buckles though. I tend to wear them and I have found that that past ones either get scratched up or they break. This years design was so nice, however, that I could not resist. I actually do have many belt buckles, of all different kinds, but I like this one and try to only wear it to work and church. If I wore a belt buckle I would get this captain black belt buckle. I really like the old ship on it. I also saw a red man and beech nut chewing tobacco belt buckle too. You can find damn near anything of eBay! I'm so bidding on that !!!!!!!!!!!!!!!!!!!!!!!!!!!!!!!!!!!!!!!! You rock , man !! A good buddy of mine made me this one probably 20 years ago. I wore it for a couple years but man it’s heavy so it got put away. I gave it to my son a month ago and he puts it on his belt for “weekend duty”. And yes, the primers are inert. They have been soaked in oil. The buckle is made of stainless steel and brass. Somehow I am not really seeing myself wearing a belt buckle like one of these. The uniform is pretty much black on black with a clergy collar. I won the Captain Black Belt Buckle ... Happy Ruff !! Awesome! I just saw it end. I was wondering if it was you that had the winning bid. I have a dozen or so different belt buckles that I rotate through. I change the one I'm wearing pretty much every week. That Captain Black one though! And that one ncrobb posted! Dang that's cool! I have one here somewhere it’s a peace sign apparently I thought of myself as a hippie when I was 13. Now just regular belts and buckles .